3hrs free undercover parking and lift access. By Car: From Tooronga Rd take Crescent Road and follow road around to left. Enter B3 Underground Carpark and park at far end of row M (dotted line on map). Take “Office and Health Services Lift” near corner of carpark to Level 1 and proceed to Suite G12-13. 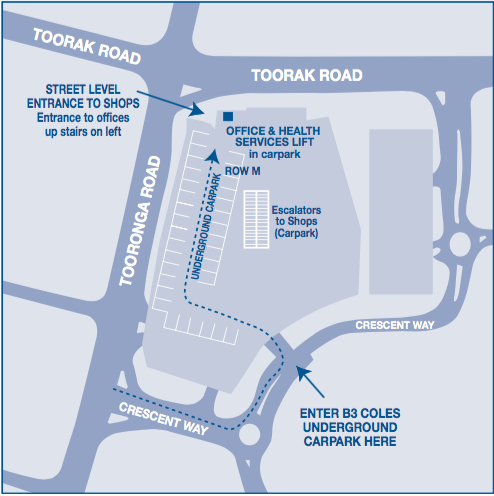 By Foot: On the corner of Toorak and Tooronga Rds, proceed up the stairs on the left outside the main entrance of the complex. Enter through glass sliding door and take the lift or stairs to level 1 and proceed to Suite G12-13. From Coles supermarket: From Coles, proceed past 1st Choice Liquor and exit complex. Take stairs on right to offices. Enter through glass sliding door and take lift or stairs to level 1 and proceed to Suite G12-13. 3 minutes drive from Sandringham Hospital down Bluff Road in the Black Rock Village. For Appointment Enquiries, please complete the form below.